Eastern Washington University (EWU) is a regional, comprehensive public university  located in Cheney, Washington, with programs offered at campuses in Cheney, EWU Spokane at the Riverpoint Campus and at multiple campus locations throughout the state. Founded in 1882, the university is academically divided into four colleges: The College of Arts, Letters & Education; The College of Business & Public Administration; The College of Science, Technology, Engineering & Mathematics; and The College of Social Science & Behavioral Sciences and Social Work. A fifth college, The College of Health Science & Public Health, is set to open in the fall of 2014 and will be based at EWU Spokane on the Riverpoint Campus. Eastern Washington University was established in 1882 by a $10,000 grant from expressman Benjamin Pierce Cheney, and was originally known as Benjamin P. Cheney Academy to honor its founder. In 1889 the school was renamed State Normal School at Cheney and in 1937 to Eastern Washington College of Education. The campus grew quickly in size following World War II. The school became Eastern Washington State College. During this era, Eastern added various graduate and undergraduate degree programs. In 1977, the school's name was changed for the final time to Eastern Washington University by the Washington State Legislature. EWU offers more than 100 fields of study, 10 master's degrees, seven graduate certificates, 55 graduate programs of study and an applied doctoral program of physical therapy. A master's in social work is offered in Everett, Vancouver, and Yakima, and a master's in education is available in Kent. A creative writing Master of Fine Arts, Interdisciplinary Studies, Child & Family Outreach Program, Communication Studies, Social Work Program (part-time Master's), Journalism, Alcohol & Drug Studies, and Counseling Education & Developmental Psychology programs are offered in Spokane. Consumers Digest has ranked Eastern as a national Top 50 Best Value school. Eastern has also made three consecutive appearances in 201 Best Colleges For the Real World. Fisheries Research Center— Performs a great variety of salmonid restoration studies including but not limited to: diet studies, population modeling, telemetry, bone regressions, bioenergetic modeling, water quality assessment, ecosystem modeling, surgical implantation of radio, acoustic and ultrasonic tags, and tributary sampling. Many reports written by the FRC can be found on the Bonneville Power Administration Website for reports: http://www.cbfish.org/Report.mvc/SearchPublications/SearchByTextAndAuthorAndDate. The Pence Union Building, or PUB, serves as the community center for Eastern Washington University. Its mission is to provide the student-centered facilities and services required by the University Community. The PUB consists of three floors that house among other things the campus bookstore, student government offices (Associated Students of Eastern Washington University, or ASEWU), Baldy's dining facility, office of student life, numerous conference rooms and the Multipurpose Room (MPR), which is used for large-scale presentations and campus events. Eastern Washington University has eight residence halls, and each one has its own personality. Discover the hall that's best for your personality and preferences. Brewster Hall, built in 2002, houses students 19 years of age and older. Brewster is located squarely in downtown Cheney offering students increased accessibility to community resources and businesses. Located on the main floor of Brewster Hall is Brickhouse Deli- a specialty sandwich shop run by the university. Dressler Hall was built in 1966. It is conveniently located behind the Pence Union Building (PUB) and is the closest hall to the Phase and Athletic Center. The majority of residents are freshmen. Dressler's most popular residential program is an annual 3 on 3 basketball tournament. Louise Anderson Hall, also known as LA Hall is centrally located directly across from the Pence Union Building (PUB) along Elm Street. The building was recently remodeled in 1999 and features a plethora of amenities found no where else on campus. LA Hall is a diverse living environment that typically houses upper class students, however all students are welcome. Morrison Hall, Built in 1970, is located about one block from the center of campus. Pearce Hall was built in 1964 and is the largest residence hall on campus. Pearce Hall is a community which is composed primarily of first year students. snyamncut, EWU's newest residence hall, snyamncut (pronounced: sin-yam-en-suit), is the Salish word for place of gathering, with the connotation of it being a special place of emotional attachment-a place of the heart. It was a special meeting place for the Spokane Tribe; an area that was mainly used for rest, relaxation and decision-making. Streeter Hall, opened in 1968, is located on the north side of campus, near three other residence halls and approximately one block from the Pence Union Building. Eastern Washington University also has apartments for students with families and single graduate students. The three apartment complexes are Anna Maria, Holter House, and the Family Townhouses. For more information regarding the University Apartments see University Apartments. The Easterner is the student newspaper of Eastern Washington University. The Easterner provides the latest campus news, sports and opinions to students, faculty, alumni and the surrounding community. All content in The Easterner is either produced or chosen by students from the University. The Easterner is distributed in print form on a weekly basis throughout the Cheney campus, Cheney business district, The Spokane Center, Riverpoint Campus and at various Spokane businesses. Willow Springs is the literary journal of Eastern Washington University. It was founded in 1977 and is published biannually. Scary Feminists / VOX (Voices for Planned Parenthood). EWU is the only regional university in Washington that has an active Greek system on campus. As of the 2012–2013 school year, there are five IFC Fraternities, four NPC Sororities, five NPHC Chapters and eight NALFO Chapters that are currently active. The five IFC Fraternities are Sigma Nu Beta Theta Pi, Delta Chi, Pi Lambda Phi, Sigma Phi Epsilon, and Phi Delta Theta. The four NPC Sororities are Alpha Omicron Pi, Alpha Phi, Alpha Xi Delta, and Gamma Phi Beta. Eastern Washington University offers club, intramural, and varsity sports. Its twelve varsity men's and women's sports teams compete in the Big Sky Conference of the National Collegiate Athletic Association's Division I as the Eastern Washington Eagles. The most-prominent athletics facilities on campus are Roos Field, Reese Court and the Jim Thorpe Fieldhouse. 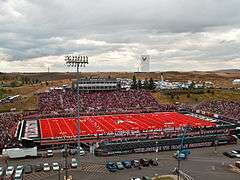 EWU has three national championships, including football (2011 – NCAA Div. I FCS), wrestling (1977 – NAIA) and men's cross country (1982 – NCAA Div. II). The Seattle Seahawks of the National Football League held the majority of their summer training camps at EWU, from 1976 to 1985 and from 1997 to 2006, from late July to mid August. Jesse Chatman, running back for the New York Jets of the National Football League. Dave Christensen, offensive coordinator at the University of Utah. Elizabeth Cook-Lynn, Native American activist and writer. Todd McFarlane, creator of the Spawn comic book series and co-owner of the NHL's Edmonton Oilers. Launi Meili, gold medalist in women’s three-position smallbore rifle shooting at the 1992 Summer Olympics. Michael Roos, former NFL offensive tackle for the Tennessee Titans. Ed Simmons, NFL offensive lineman for 11 yrs Washington Redskins. Tom Sneva, former race car driver, Indianapolis 500 winner in 1983. Isaiah Trufant, NFL cornerback for the New York Jets, younger brother of former Seattle Seahawks cornerback, Marcus Trufant. ↑ EWU Identity Standards (PDF). Retrieved 2016-03-29. ↑ "EWU - Facts at a Glance". ewu.edu. ↑ "Colleges and Institutions in Washington". wa.gov. ↑ "EWU - About EWU". ewu.edu. ↑ "EWU - CALE Home". ewu.edu. ↑ "EWU - CBPA Home". ewu.edu. ↑ "EWU - College of Science, Technology, Engineering & Mathematics". ewu.edu. ↑ "EWU - CSBSSW Home". ewu.edu. ↑ "EWU - Academics at Eastern". ewu.edu. ↑ "EWU - EWU Creates New College". ewu.edu. ↑ Davis, Hugh (June 14, 1977). "Eastern changes few". Spokane Daily Chronicle. Washington. p. 19. ↑ Emerson, Stephen (April 1992), National Register of Historic Places Registration Form: Washington State Normal School at Cheney Historic District (PDF), retrieved February 5, 2015 . ↑ "EWU - Programs by College/School". ewu.edu. ↑ "EWU | Academics at Eastern". Ewu.edu. Retrieved August 20, 2012. ↑ Weaver, Dan (October 2, 1983). "Local boy makes good". Spokesman-Review. p. D1. ↑ Taylor, Ihsan. "Best Sellers – The New York Times". Nytimes.com. Retrieved December 11, 2013.